Portable, Rechargable 4-Channel Micro PA Speaker With Bluetooth A great companion for the traveling player. The Mackie ..
A great companion for the traveling player. The Mackie Freeplay is a small, lightweight yet powerful portable PA system loaded with intuitive features which give the user ultimate control at all times. Whether your taking your sounds to the beach, heading into town for a spot of busking or even just listening to music at home, the Mackie Freeplay handles it all with ease. The 4-Channels allow you to connect an electro-acoustic guitar, microphone via XLR input while also wireless streaming backing tracks via Bluetooth from your smart phone. 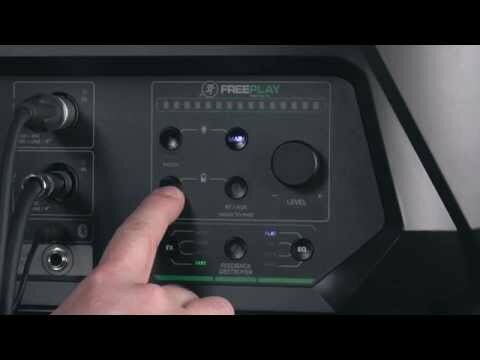 Built into the Mackie Freeplay are 16 high quality effects including reverb and delay. Mackie's Freeplay Connect App lets you adjust everything from the input volumes, 3- band EQ, effects and more all from your smart phone making live performance out and about a breeze. AC or battery power with optional lithium ion pack.